KITCHEN 9' 10" x 6' 6" (3m x 2m) Fitted with a range of wall and floor mounted kitchen units comprising cupboards and drawers. Roll edge work surfaces with tiled splash backs. Stainless steel sink unit. Space for an electric cooker. 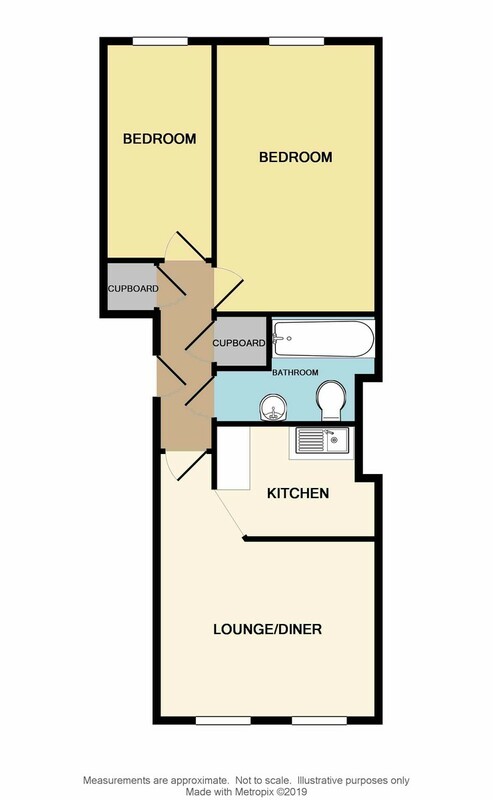 Spaces for a washing machine and an upright fridge freezer. BEDROOM ONE 16' 4" x 9' 6" (4.98m x 2.9m) Window overlooking the communal gardens. Electric heating. BEDROOM TWO 13' 0" x 6' 10" (3.98m x 2.09m) Window to the rear aspect. BATHROOM Suite comprising panelled bath with an electric shower unit and glazed shower screen. Close coupled WC. Pedestal wash hand basin. Tiled walls. Extractor fan.